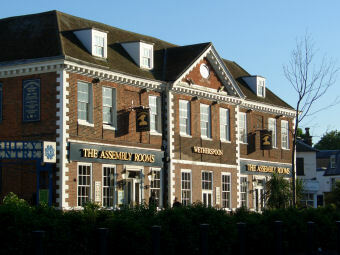 croydonpeer comments that the Assembly Rooms is the busiest pub for 25 miles that covers all of Greater London! Too many sherberts for the little lad,don't lie in such a stupid fashion! Nice place for a few cheap lagers before heading of to my more exclusive haunts where the ladies are waiting. This is the busiest pub in about 25 miles! Good food/beer, busy, efficient - and in Epsom centre. Have us residents made the wrong choice/decision? The staff here strut around a treat customers with contempt, a very hard thing to show so much chutzpah when your on £6.50 an hour! I only visit for a quick coffee the beer is s***.